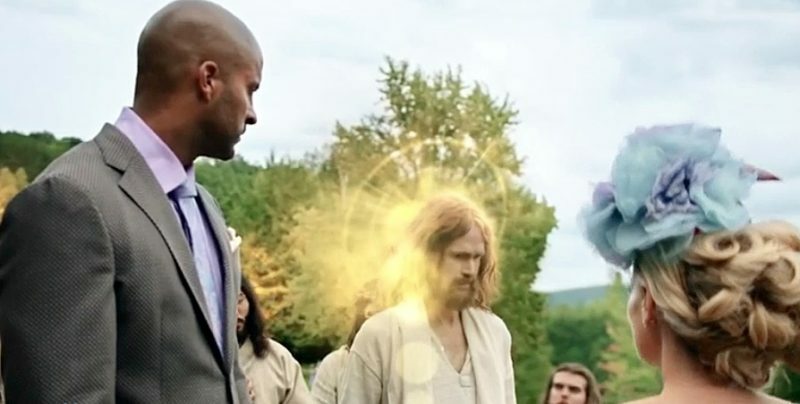 First things first; this post contains ***Spoilers for Sunday’s American Gods finale, “Come to Jesus”***, so if you want to know nothing, back on out. Via Spoiler TV, who has a sneak peek at Episode 8, here’s your first look at Jeremy Davies as JC, as backhandedly introduced by Ian McShane’s delightfully vulgar Wednesday. but in particular Jesus Christ, who Wednesday accuses of having stolen Easter’s (Kristin Chenoweth) glory. though since JC was resurrected, even if people observe rituals and mouth Easter’s name, they have no idea what it means. Jeremy Jesus is duly remorseful for his part in things. American Gods‘ first Season finale airs this Sunday on Starz, and I can’t bleeping wait.